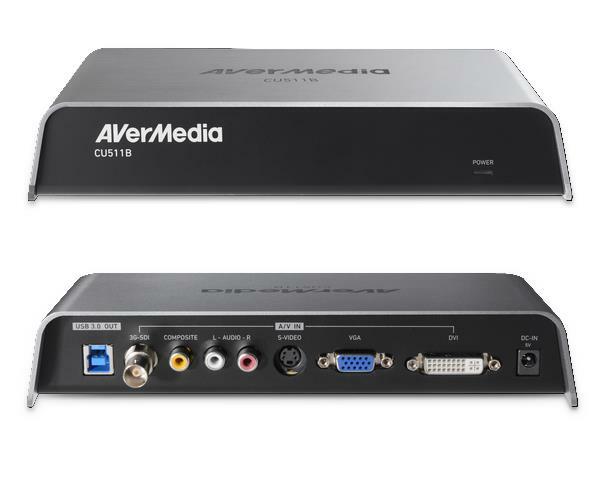 AVerMedia, a global leader in the frame capture market and manufacturer of digital multimedia video convergence technology, has released the CU511B, a versatile Full HD and SD video capturing box. The CU511B supports an extensive analog and digital video inputs (HDMI/ DVI/ VGA/ Composite/ S-Video/ 3G-SDI) and allows you to capture video directly from your existing video equipment without worrying about converting your video equipment's output format to match that of the video capturing box. Additionally, the USB 3.0 interface to your PC provides enough bandwidth for high definition lossless video capturing up to 1920 x 1200 at 60 frames per second (fps). The CU511B is the extremely compact way to get full connectivity for HD/SD video capturing. Supporting any and all video resolutions up to 1920 x 1200, the CU511B extends the ability to capture video from virtually any source. Accelerate video capture workflows by easily integrating the CU511B into any existing environment, HDMI, DVI, VGA, composite, audio input connectors (L/R), S-video, and 3G-SDI. The CU511B connects to any SD or HD interface to provide the ability to upload all existing media into a video library or storage server of your choice. The CU511B is a 8-bit HD/SD video capture/playback device that supports USB 3.0, and enables the transfer of uncompressed video to a computer in stunning HD at 60 frames per second (fps). The result is complete flexibility to record from nearly every class of video source in a business, education, and health care environment. Thanks to its high speed USB 3.0 interface the CU511B delivers its highest resolution at 1920 x 1200 video 60 fps of uncompressed video for professional quality of playback on laptops and desktop screens. Medical Imaging: capture and save critical image and medical imaging equipment in real time. Industrial inspection applications: strategically suited for the recording of audio/video from within an industrial inspection process. The CU511B HD & SD capture box provides simple and complete video capturing from any HD or SD source. It is built on solid technology with added function allowing the capture of customized resolutions for all recording needs. The implication is clear for professional users; the CU511B is the complete package. The CU511B supports two major software architectures: Direct Show and Plug-in, giving users access to the most popular video editing software applications. The CU511B is a versatile PC-based Full HD and SD video capturing box with complete input support, USB 3.0 interface, and resolution adjustment tool. The CU511B is ideal for users wanting to capture video with full control from any source without requiring extra video equipment.